(CNN) - One of the nation's largest labor unions gave an early endorsement to Pres. 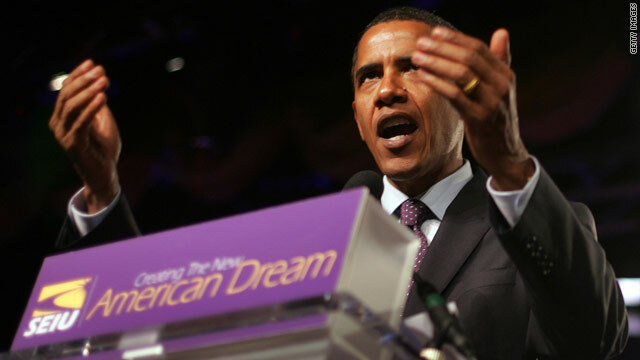 Barack Obama Wednesday, using lingo from the Occupy movement to describe the incumbent president as standing with the 99%, rather than millionaires and corporations in the 1%. "As Americans we face stark choice," Service Employees International Union president Mary Kay Henry said Wednesday. "Do we want leaders who side with rich corporations, the 1% who are prospering, or leaders who side with us, the 99 percent?" The SEIU, which represents 2.1 million workers in a wide swath of American service industries, has long endorsed Democrats in political races. The union endorsed Obama in February 2008, when he was still locked in competition with fellow candidate Hillary Clinton. With no Democratic primary this cycle, the union's endorsement of Obama was all but assured. Henry did note the group was endorsing Obama early in the cycle to make their intentions clear. "The early endorsement is to make crystal clear what kind of country we want and that we think President Barack Obama is the leader that will help make that a reality in this country," Henry said. Henry said the Occupy movement, which opposes the unequal distribution of wealth in America, provided a strong ally for the SEIU in its endorsement. "This is about our members being united in the belief that things are broken in this country, and we need to come together in numbers to help fix it," Henry said. "That means joining forces with students, neighbors, the unemployed, and working people in the encampments. This is an act of solidarity with the 99% movement." But in an interview, Occupy DC spokesman Sam Jewler denied any alignment with the union. "We certainly have not endorsed President Obama or any other politicians," Jewler told CNN during an interview Wednesday at an impromptu tent city a few blocks from the White House. He said from his perspective, "the whole system has problems, so there's no single politician who's able to fix the money and politics, the growing wealth disparity. None of them can answer to that, because all of them are taking money from the corporations and the wealthy." Jewler acknowledged SEIU has provided support for OccupyDC, such as allowing demonstrators to use showers in the union's Washington office building, but that there was no implied endorsement of SEIU's use of the group's rally wording. "Any time they use the rhetoric of 99% or the Occupy Movement, that's entirely on them. It has nothing to do with anything we're saying to them," Jewler said. "We're having a lot of influence on the national conversation, so a lot of people are going to be using that language. Personally, I think that the more it gets out, the better," while adding, "I certainly don't like to see it co-opted and used for disingenuous purposes." Henry said her organization would help the president's re-election bid by mobilizing members to volunteer and providing education materials about the economy. According to CNN national exit polls from the 2008 election, 61% of voters who said they were in a union voted for Obama. In a statement, Obama campaign manager Jim Messina said the endorsement from SEIU was a step toward creating American jobs. "SEIU and the President share many common goals - chief among them a belief that we must do everything we can to create good-paying American jobs and a fair economic foundation that will let all workers succeed," Messina's statement read. "Throughout the next year we'll employ that same energy and unity, working together to do everything we can to ensure the President has four more years to strengthen middle-class families' economic security." Republican support for the 1% is exactly why Obama will win a second term. The republicans have sided against women, the poor, the middle class, public employees, private employees, hispanics, blacks, veterans, seniors, the 50 million without insurance, college students, and a number of religions. With a $60 billion break Obama gave the unions in ObamaCare they had better be coming up with ways to stuff the ballot boxes for him! The rest of you get back to work! You have his union give-aways to pay for. How are the 99 going to survive when the the 1% take their money and leave? Remember back in 2008 when we were losing 750,000 jobs per month prior to Obama taking office. Post Obama inaguration we have had 20 months of growth. The 99% is mad that the Republicans are BLATANTLY trying to thwart EVERYTHING Obama does to help this country. And what policy, with the exception of the re-investment act, has Obama been able to put forth? I ask becuase this congress has broken a record with the amount of fillibusters used to thwart his agenda. So what policy's are you harping about now? SPECIFICS!!!!! Seriously, if Obama gets re-elected in 2012 there will be no America left by 2016. We will be a 3rd world country. We going to vote all the do nothing republicans out of the office. Obama is a good president let send republican message to not go against american we will vote republicans out of the office. The Republican Tea Party and their presidential candidates have made their mission in life to demean, denounce, disband and dismantle unions across the country. In what universe were they not going to endorse Obama? RINO Bill ... I wonder why American cars are made in Mexico, Canada, South America instead of Detroit???? Or why there are no steel plants in the U.S. anymore???? Couldn't have anything to do with unions could it? we had Obama and the Democrats with a filibuster proof majority, this is why we are in this mess, this is why Obama and the Obama administration is such a huge failure. Big labor expects the Democrats to continue to support the labor movement, whether that makes any real sense, or not. Obama obviously supports big labor, or they wouldn't be trying to force Boeing to hire union members in SC, which is a right to work state. I can't believe people like you. Where has he been? Fighting on my and your behalf. Trying to get unemployment benefits extened, held hostage by Bush tax cuts. In earnest he has tried to work with the Republicans, offering 4 trillion in cuts, even offering up medicare and medicaid, to have this offer thrown in his face. Where has he been? fighting, winning, and emerging as one of the most productive presidents in modern history. This would be mentioned more, but because he is Black, he is judged by a differnt set of standards. Case in Point: He got health care done, Clinton didn't and no one makes that parallel when the afforadble healthcare act is mentioned. @ Four and Door – If you are referring to the policies he implemented during 2009 and some of 2010, then I will say those things have yet to take effect. Most things delay in implementation, it's to reduce costs. However, did Obama have the votes to implement the things he wanted to do? Nope. He never did. He was always stumped by filibusters in the Senate by obstructionist Republicans. So we either got nothing or watered down conservative economic ideas passed. Still, Obama will be re-elected once people see what the alternative is. Even another flip flopper from MA Romney. He's basically John Kerry for the Republicans. Oh, and Kerry lost to GWB, for goodness sake! The downward trend started in 2007 when the Democrats took over Congress and accelerated when Obama became president in 2008. We now have 3 of the 4 indicator of a second Great Depression in America, unemployment over 20%, housing sales the worst showing in 13 years and retail sales down year over year since Obama took office. Obama and his amateur hour administration have no clue how to create jobs, run a business and make payroll or a budget. Seriously, America? Surely we can do better. I worked in the oil fields through high school and college and I hate unions so you don't know what you are talking about. They are a bunch of thugs and never did anything but delay work. I have been a geologist the 25 years and thnakfully have worked mostly in southern states where we hire and fire people based on skills and work ethic. Unions are a crutch for the lazy. Is that the same 99% of the SEIU/ACORN controlled group that is shooting people and defacating in public and private parks and is threatening to blow up Macy's. That is a good group for this incompetent, inept, corrupt, union toady president to be associated with. He used to work for them in his only job experience hanging posters on telephone poles you know. What majority are you talking about? How soon we forget that Edward Kennedy was ailing during this time, that's one, Ben Nelson who votes with the Republicans 4 out of 5 times, thats 2, and Joe Lieberman the Independant who caucuses with the Dems, but votes with the Pubs, thats 3. Again... Huh???? And i'll ask you as well, what legislation has Obama put forth that has caused any of what we are dealing with now. USE SPECIFICS PLEASE!!!! I guess all those union pay-offs are paying off for Obama. President Obama may have not gotten everything right, but he is far better for America at this time than any other candidate. He is a hardworker, sincere, intelligent, fair and most of all much more for the average person than the republican candidates. DO you not rember the term " ownership society" this was Bush trying to get everyone in AMerica to own a home. Couple that with his hands off approach to energy, letting the speculators run rampant is what caused this.